What's your favorite color fÃ¼r regular light skin? 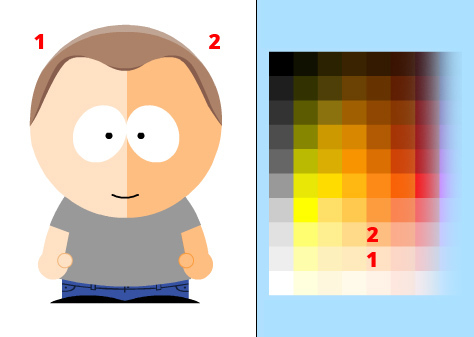 Please answer this quick question about the skin tones. When you build a character with regular light skin, what's your favorite color to select? I think those two colors are possible choices, but I wonder if it would be even better to have a color that's in the middle between them. Because sometimes I feel like one of them is a little bit too light and the other one is a little bit too dark. Or would this be more confusing than helpful? It depends a lot on your screens. So how do you feel about it? Are you fine with the current colors for light skin or should I add one more? It would replace one of the darker orange tones. I tend to use the darker one but the other one is good for lighter skinned characters. A third colour would be really useful though. Ideally, it would be great if you could just move a slider, or if you could select from a color wheel, so you could get the exact shade you want. But that might not be feasible. Actually a automatically generated color palette lke a slider or wheel is not so difficult to include. This is why most character creation tools use it. But it has one important disadvantage: The highlights and shadows for each color (as used for the hairstyles and other custom color objects) are generated automatically as well. For example all the lighter shades add 15% white and the darker shades add 15% black to the original color. While this works fine for some colors it looks ugly for others. Yellow needs a totally different set of shades than dark blue. This is the main reason why I stick with my limited palette of colors where all shades are hand-picked. I haven't seen a automaticly generated palette yet where I am satisfied with the highlights and shadows. Another advantage is that it is easier to remember a color you picked for another part of the picture.